↑ "Dubai opens world's tallest building". Dubai: USA Today. January 2, 2010. สืบค้นเมื่อ 4 January 2010. ↑ "Official Opening of Iconic Burj Dubai Announced". Gulfnews. 4 November 2009. สืบค้นเมื่อ 4 November 2009. ↑ "World's tallest building opens in Dubai". BBC News. 2010-01-04. สืบค้นเมื่อ 2010-01-04. ↑ "Haiti president describes `unimaginable' catastrophe; thousands feared dead". Miami Herald. 13 January 2010. สืบค้นเมื่อ 13 January 2010. ↑ "Hundreds of thousands may have died in Haiti quake, PM says". CNN. 13 January 2010. สืบค้นเมื่อ 13 January 2010. ↑ "Thousands feared dead in Haiti quake; many trapped - Yahoo! News". News.yahoo.com. Archived from the original on 2010-01-14. สืบค้นเมื่อ 2010-01-13. ↑ Newitz A (2010). "Why the Chile earthquake deformed the earth and shortened our days". io9. Retrieved 20 March, 2010. ↑ Than K (2010, 02 March). 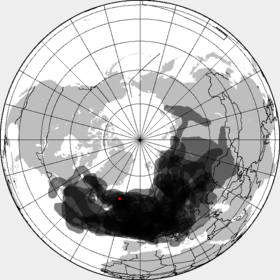 "Chile earthquake altered Earth axis, shortened day". National Geographic News. Retrieved 20 March, 2010. ↑ 林紳旭 (2010-03-04). "高雄強震 全台96人受傷". CNA. สืบค้นเมื่อ 2010-03-08. ↑ "Death toll rises to 1,484 in China quake". Xinhuanet. สำนักข่าวซินหัว. 2010-04-17. สืบค้นเมื่อ 17 เม.ย. 2553. ↑ "Cancellations due to volcanic ash in the air". Norwegian Air Shuttle. 15 April 2010. สืบค้นเมื่อ 15 April 2010. ↑ "Iceland Volcano Spewing Ash Chokes Europe Air Travel". San Francisco Chronicle. 15 April 2010. สืบค้นเมื่อ 15 April 2010. ↑ "Live: Volcanic cloud over Europe". BBC News. สืบค้นเมื่อ 2010-04-15. ↑ "Greece crisis deepens on global market sell-off". CNN. สืบค้นเมื่อ 2010-04-28. ↑ "Greece Accepts Terms of EU-Led Bailout, 'Savage' Cuts (Update1) - Bloomberg.com". สืบค้นเมื่อ 2 May 2010. ↑ "CIDRAP News - WHO says H1N1 pandemic is over". ↑ "All 33 Chile miners freed in flawless rescue". Chile: MSNBC. October 13, 2010. สืบค้นเมื่อ 14 October 2010. ↑ "UN 'confident' disease has been wiped out". BBC. 14 October 2010. สืบค้นเมื่อ 14 October 2010. ↑ "Cuban Plane Crash Kills 68 People". The New York Times. สืบค้นเมื่อ 6 November 2010. ↑ "Antimatter atom trapped for first time, say scientists". BBC News. 17 November 2010. ↑ "Government decreases death toll in Cambodian stampede". CNN. 25 November 2010. สืบค้นเมื่อ 25 November 2010. ↑ "Tensions high as North, South Korea trade shelling". Dawn. 24 November 2010. สืบค้นเมื่อ 24 November 2010. ↑ "Two Koreas exchange fire across maritime border". Reuters. 2010-11-23. สืบค้นเมื่อ 2010-11-23. หน้านี้แก้ไขล่าสุดเมื่อวันที่ 16 เมษายน 2562 เวลา 19:18 น.